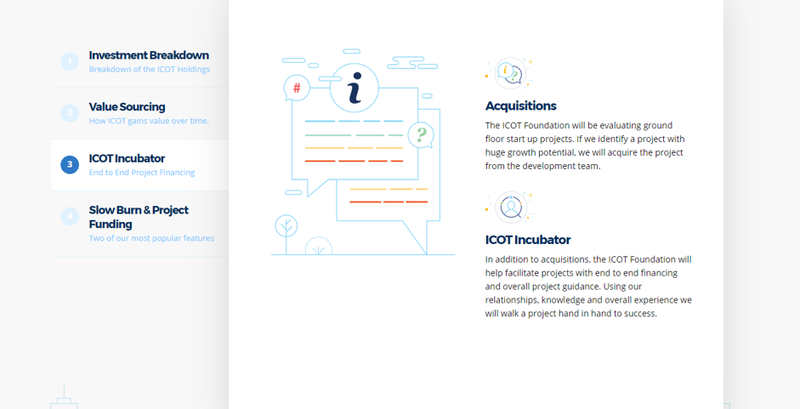 Decentralized Investment Platform for newcomers who want to invest in ICO but have little knowledge in the crypto space. 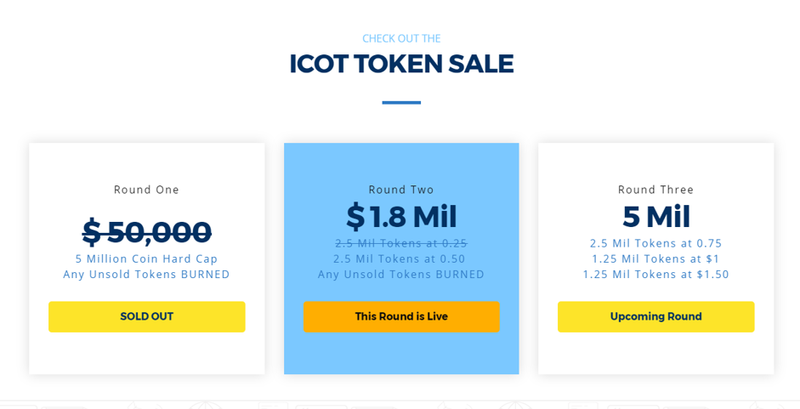 The ICOT concept will help brand new investors get into the crypto scene and there is certainly no shortage in that. The team doesn't require blockchain experience. Although you have to trust the founder and his associates to make your investment decisions. Whitepaper outlines the investment plans pretty clearly. Management fees are made public and investors have a brief idea of ICOT's investment plans. 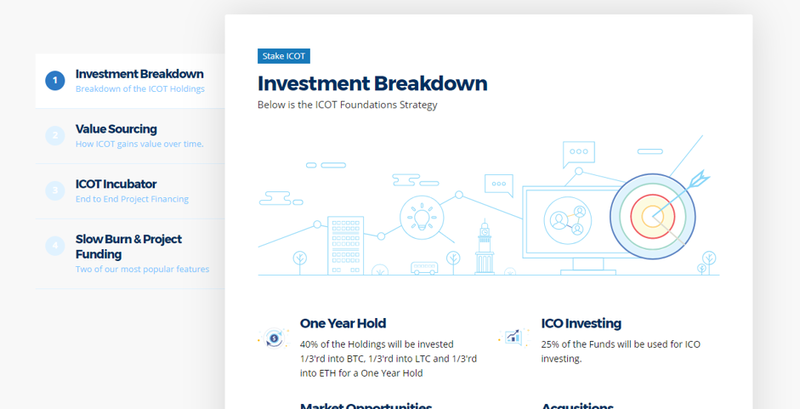 ICOT appears to be operating as a simple Cryptocurrency Hedge Fund for people who want to be invested in the space however, has no idea where to put their money into. This can be a great opportunity for newcomers to invest in the space without having to learn the complex nature of blockchain technology. Investment platforms usually require some sort of authority to operate. We could not find this information on the website or whitepaper. The ICO Token Fund is an easy gateway when it comes to investing in the growing crypto-space. 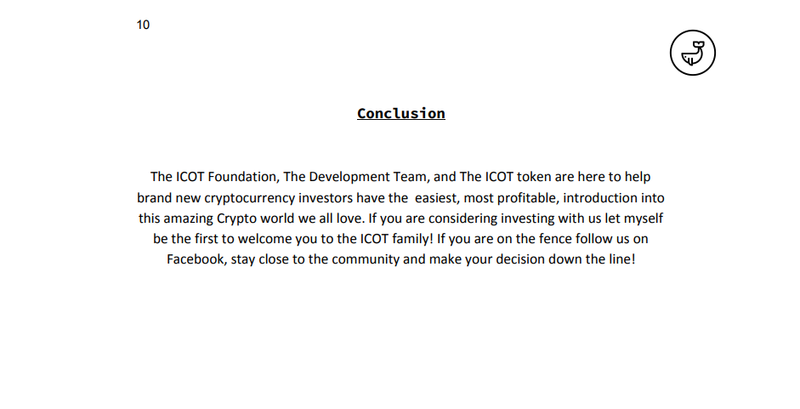 What ICOT is attempting to do is make educated investment decisions for their investors. Provided the team can make appropriate fundamental and technical analysis, the fund should only grow bigger over time. When it comes to investing within the space, it can be particularly be scary for someone who isn't used to the amount of volatility. Ultimately the investors performance should reflect the value of the token. If you take a look at their whitepaper and agree with their investment models, it could be a good fit. Keep in mind that although diversification is usually a good investment strategy, there is always a degree of risk involved.